Home » air freshener , air freshener offer , bigen n natural color , pack of glade air freshener » Pack of Glade Air Freshener & Bigen N Natural Color at Just Rs.93 only. 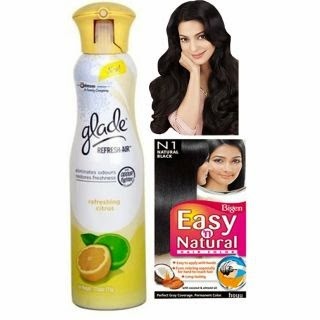 Pack of Glade Air Freshener & Bigen N Natural Color at Just Rs.93 only. Here you can get Pack of Glade Air Freshener & Bigen N Natural Color worth of Rs.335, can be get it at Just Rs.93 only. Please hurry to take the advantage of this discount offer. Make the final payment of Rs.93 only.